The McKinsey Case Interview Training Programme has been specifically designed to get you a job at McKinsey. It is recommended by the Harvard Graduate Consulting Club. McKinsey case interviews are different to those from other consulting firms. They follow a pre-defined structure and the interviewers tend to be more challenging than at other companies. The programme will provide you with basic and advanced maths techniques that will help you increase your mental calculation speed. This is really important as most of McKinsey case interviews involve maths. It will also teach you how McKinsey case interviews are structured and provide you with a simple method to consistently crack the different questions your interviewer will ask you. 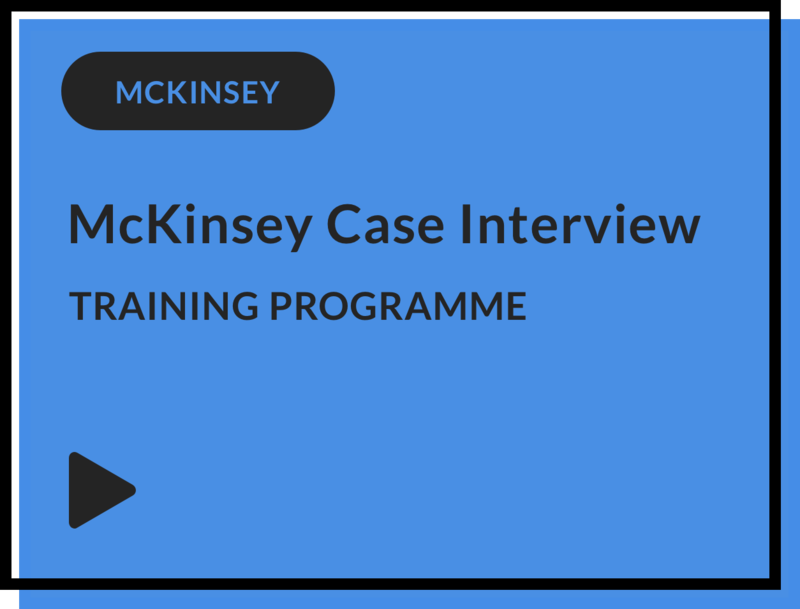 All the cases used in the training programme come from past McKinsey case interviews to ensure you train with the most realistic material possible. This will enable you to get familiar with the case format used by McKinsey and to avoid any surprises on the day of your interview. The programme includes six live case videos where you can watch a best-in-class candidate being interviewed. In addition, you will also get five full case interviews and 15 individual practice questions to either complete by yourself or with a partner. All our materials come with detailed answers and special tips based on the IGotAnOffer method. At the beginning of each interview with McKinsey, you will spend 10 minutes discussing an aspect of your CV with your interviewer. Each of your McKinsey Personal Experience Interviews (PEI) will be focused on a different topic (E.g: leadership, conflict management, etc.) and you therefore need to prepare answers in advance. The programme includes a 1h training video to make sure you impress your McKinsey interviewer when you answer PEI questions. It both covers the main type of PEI questions and how to answer them effectively. Excelling at PEI questions is a great way to set yourself apart. Stuck on a specific McKinsey case interview? Need help to answer quantitative questions faster? Our dedicated support team of experienced interviewers is at your disposal to help you fine-tune your preparation. You can contact us at support@igotanoffer.com for any questions on McKinsey case interviews. We typically reply to emails under 24h but it can sometimes take us up to 48h during busy periods of the year. We know training for McKinsey case interviews is an important investment and we only want you to incur the full cost of the programme if it helps you get a job at the firm. We operate a 50% money back guarantee if you do not get a job offer from McKinsey. All you need to do is to upload the email you received from McKinsey in this short refund application form. To be eligible for that guarantee you need to actually interview with McKinsey. This guarantee does not cover cases where you are not invited to interview, or decide to cancel your application with McKinsey. Summary of materials included: 1h IGotAnOffer method training video for case interviews, 1h training video for Personal Experience Interview questions, 6 live case interview videos, 5 full McKinsey case interviews PDFs with detailed answers, 15 McKinsey individual questions PDFs with detailed answers, basic maths video, advanced maths video and calculation workbook. All materials are automatically accessible for the 12 months following your purchase. Beyond that initial period, you can contact us to extend your access for free. * Here is how we calculate our success rate. Candidates who train with us get part of their money back if they do not get a job at McKinsey. We assume that candidates who do not claim back this amount got a job at McKinsey. The figure quoted is simply calculated based on all candidates who trained with us since we launched this programme at the beginning of 2016 and is updated regularly. Historically the guided success rate has always been slightly higher than the self-study rate.